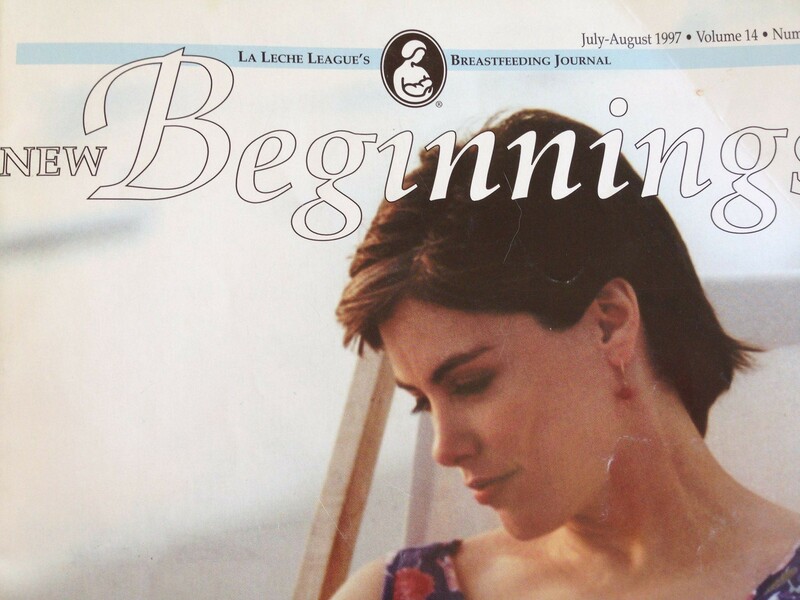 About 20 years ago when my children were small, I wrote an article that was published in a breastfeeding magazine called New Beginnings. My first baby, a son, had significant nursing difficulties when he was born. Over several weeks we overcame our problems with the help of a young nurse who came to my house regularly. During those tenuous first weeks, the advice of doctors and my own family was to switch to formula. But I persisted, and I am happy to say I was successful. Soon after that I had a daughter, and I was so relieved that she was latching on like a champ! But then she was diagnosed with a rare condition which compromises her ability to metabolize galactose, and doctors advised me, yet again, to wean her and give her soy formula. I did not want to end our nursing, so I decided that I would persist, but proceed cautiously. 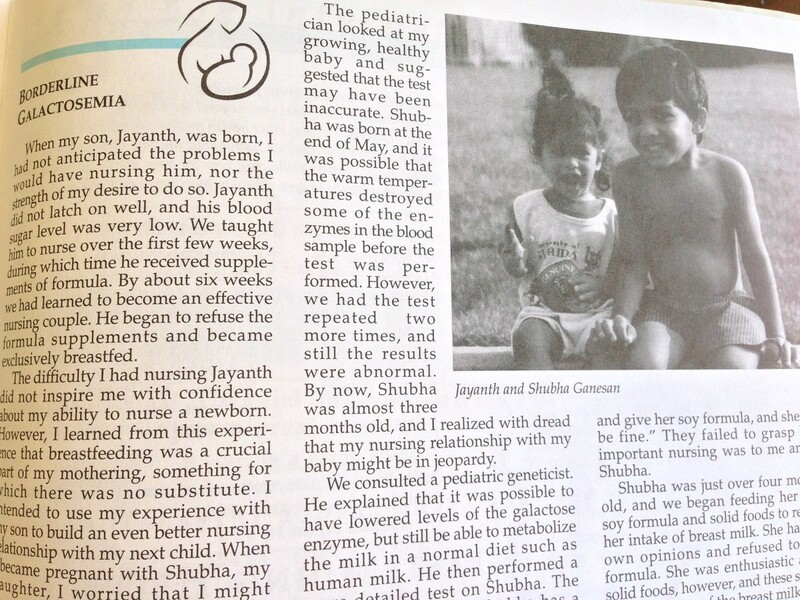 The article in New Beginnings might have been one of the first documentations of nursing a baby with the Duarte Galactosemia condition, and it got a little bit of attention. Years later people were still emailing me and asking me about my experience, and even for advice. I look back at what I wrote, and I can see how worried and obsessive I was, counting nursings and monitoring galactose levels. But now I don’t remember any of that, and instead I remember how close my daughter and I were. My nursing relationship with my daughter continued long after I wrote that article, until she was exactly 5 years old. She was only nursing once or twice a day at that time, probably when she was tired. She was a lovely little girl, having charmed her teachers at preschool she was now ready to enter Kindergarten and be a big girl! Throughout the whole experience I resisted the pressure to end the nursing relationship. It was easy for everyone to advocate, but it was a significant part of the bond between me and my babies. I have remained a strong proponent of breastfeeding over the years. But recently something happened that made me wonder if my advocacy has been too limited and prejudiced. It began when I read a book that was set as my son’s freshman reading when he was admitted to Duke University— Eating Animals by Jonathan Foer. This book led me to question whether it is right to be taking the mother’s milk that belongs to another baby — in this case, a calf. 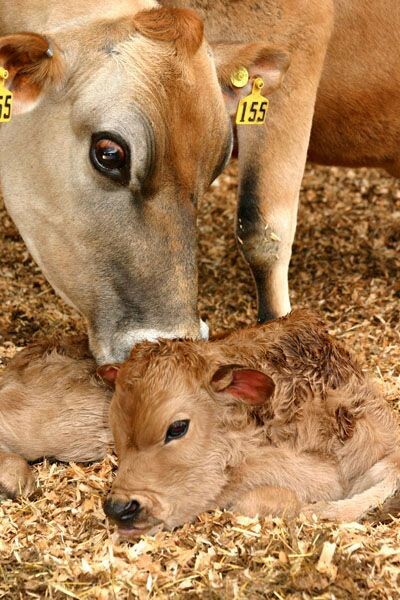 Dairy cows do not make milk for humans — they make milk to feed their own babies. A female only makes milk when she has a baby — whether it is a human female or a bovine female. In the dairy industry, female cows are forcibly impregnated so that they will lactate when their calves are born. So in this process, the baby calf is a by-product of the dairy industry. 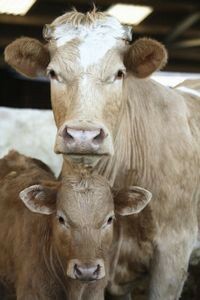 But to the mother cow, her calf is everything. To the calf, the mother is the center of the universe. They want to be together, just like we want to be with our babies. But because the industry does not need the calves, especially the male calves, they are separated from their mothers and killed immediately, or confined alone for a few more months in a small cage to be killed for veal. 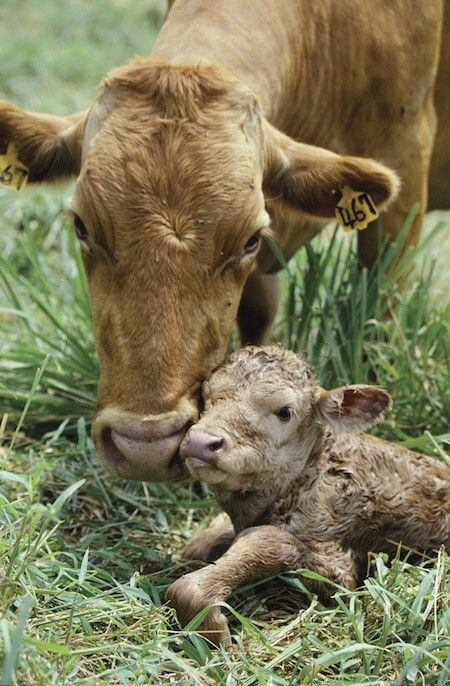 The calf is given formula so that his mother’s milk can be sold in supermarkets. Over some months, I began to figure out that what I was doing when I ate yogurt, cheese or ice cream was taking the milk that belongs to other babies. I had been fixated with my own nursing relationship with my babies, but I did not spend a moment’s thought on other nursing relationships that I was disrupting every day when I ate my meals. I could excuse myself by saying that I was doing what everyone else was doing, and what I was taught to do. But I also prided myself on being an independent thinker. I was, and I am, a strong woman. After all, continuing to breastfeed my two children against the advice of family and doctors, and ultimately being vindicated in that decision, attested to my strength and conviction. I held the nursing relationship as the core of mothering infants. I nursed on demand, I wore my babies, and I co-slept with them. 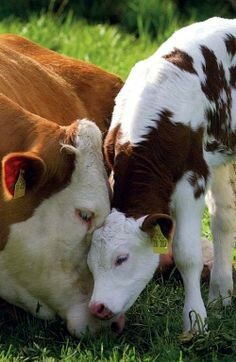 Surely a similar physical relationship is important for the mother-child bond that the cow and her calf as well, especially if they do not have the cognitive or language capacities for a more abstract relationship. I have seen so many videos now of how newborns are torn away from mother cows, and how mothers fight back to keep their babies; how they attack the farmer who is taking her baby, and how they run after the truck that is carrying the calf. I have heard the heart-rending bellows of cows grieving the loss of their babies. I have also seen how calves try to run back to their mother, and how they seek her out among dozens of other mother cows. Soon after I read that book my son was assigned, I became a vegan and an advocate for animal rights. I read the book Farm Sanctuary by Gene Baur, where early he explains how he learned about veal calves being taken from mothers to be chained in crates for the whole of their short lives, unable even to turn around. At a later point in the book, he notes how these calves play when they are let loose for a while. It was when I described this to my husband that he also became a vegan. The animals whose bodies and secretions that we eat, be they cows or pigs or chickens, feel emotions as strongly as we do, and perhaps they feel them even more strongly. They feel the strong bonds of family; they become attached and love each other. I am grateful for my children for allowing me to understand this, and I look forward to the day when all nonhuman families are given the respect they deserve. Vegan and former vivisectionist. BA (Oxon), PhD, MBA, formerHumane Educator. Mother of five, two humans, one dog and two cats. From Tucson, Cardiff and Chennai.